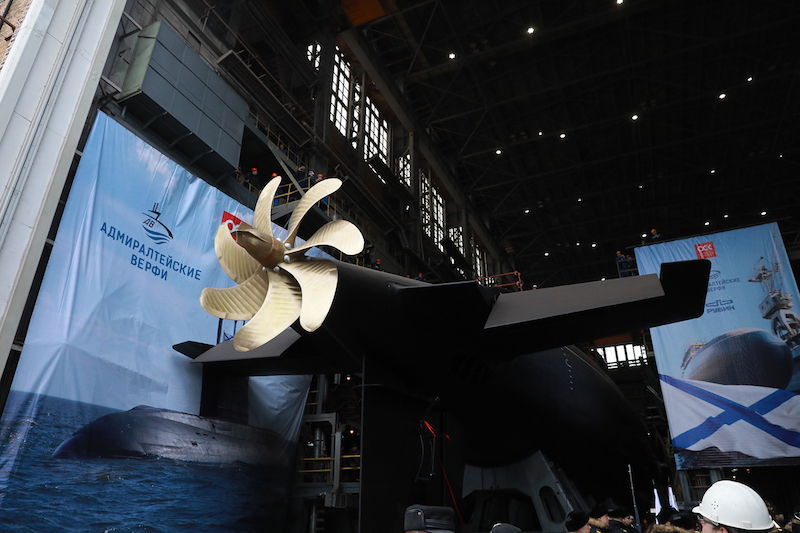 ST. PETERSBURG --- The first Project 636.3 submarine Petropavlovsk-Kamchatsky has been floated out for Russia’s Pacific Fleet at the Admiralty Shipyard in St. Petersburg, TASS reports from the scene. SAINT-PETERSBURG, Russia --- A ceremony for the launch of the large diesel-electric submarine Petropavlovsk-Kamchatsky for the Russian Navy was held today at the Admiralty Shipyards JSC (part of the United Shipbuilding Corporation). The Deputy Commander-in-Chief of the Russian Navy, Vice Admiral Igor Mukhametshin, took part in the event. The submarine "Petropavlovsk-Kamchatsky" was laid down in July 2017 and, in accordance with the terms of the contract, will be handed over to the customer by the end of this year. On the second ship in the Volkhov series, the process of docking the blocks into a single hull has begun today. The construction of two more ships, Magadan and Ufa, is at the stage of building blocks and conducting hydraulic tests. The contract for the construction of the series was signed in September 2016, which was a continuation of the implementation of the long-term plan of the Ministry of Defense of Russia to enhance the combat readiness of the Russian Navy and the program to improve diesel-electric submarines. At the direction of the Ministry of Defense of the TsBB Rubin, modernized the main systems of the ship of the basic Project 636: a complex of torpedo-missile launchers, armament information and control system, radar and hydroacoustic complexes. A number of improvements have been made to general ship systems in order to increase the stealth of the submarine and improve the living conditions for the crew. Submarines of the modified project 636.3 have higher (compared to previous projects) combat effectiveness. The optimal combination of acoustic stealth and target detection range, the latest inertial navigation system, modern automated information and control system, powerful high-speed torpedo-missile armament ensure that ships of this class lead the world in the field of non-nuclear submarine construction. Admiralty shipyards are the undisputed leader in the construction of submarines of this class and have been successfully exporting them since 1983. Admiralty shipyards also built in just six years, from August 2010 to November 2016, a series of submarines of this project for the Black Sea Fleet. Starting in 2014, the company delivered two ships to the Russian Navy each year. It is important to note that the construction of a series of submarines takes place under conditions of full production load and large-scale reconstruction of the enterprise. The construction of new facilities, and the modernization of existing shops is carried out without interrupting production, and the construction of all orders is carried out clearly in accordance with contractual obligations.